Of Professor Fishkin's three criteria for success for the Tomorrow's Europe Deliberative Poll, the first - representativeness - we are still working on (and help is still much appreciated). The second is "Is it deliberative" - and on that front it's still a bit too early to say as the results won't be released until Thursday. However, there is enough information available to make an educated guess. By the Fishkin model, deliberation appears to be proven if the participants are shown to have changed their opinions during the course of the weekend's events. But is this enough to demonstrate that true deliberation has taken place? Deliberation should, in this context, mean the discussion of opposing views in the hope of coming to an informed and logical opinion. Yet were the participants in the Tomorrow's Europe poll given enough information on which to base their discussions, and were their discussions as fair and impartial as the organisers have claimed? The briefing materials provided to the participants rightly noted that "it is difficult to be totally objective", but note that the matierials have been scrutinised by various politicians and experts from all political persuasions, ranging from the eurosceptic Jens-Peter Bonde through to the pro-EU Andrew Duff. Indeed, in terms of the (necessarily) vague overviews of the differing aruments, there does indeed seem to be a good degree of balance. For each area of policy - ranging from the welfare state through to the future enlargement of the EU - three points are given in favour, three against. But with the briefing materials stretching to just 25 pages of lightly-typed A4, is this really sufficient to reach an informed decision? Where are the statistics to back up the opposing views? Where are the facts? Where is the run-down on which EU countries currently take what line? Where, indeed, is the detail on what the EU's current policy is on the various areas? 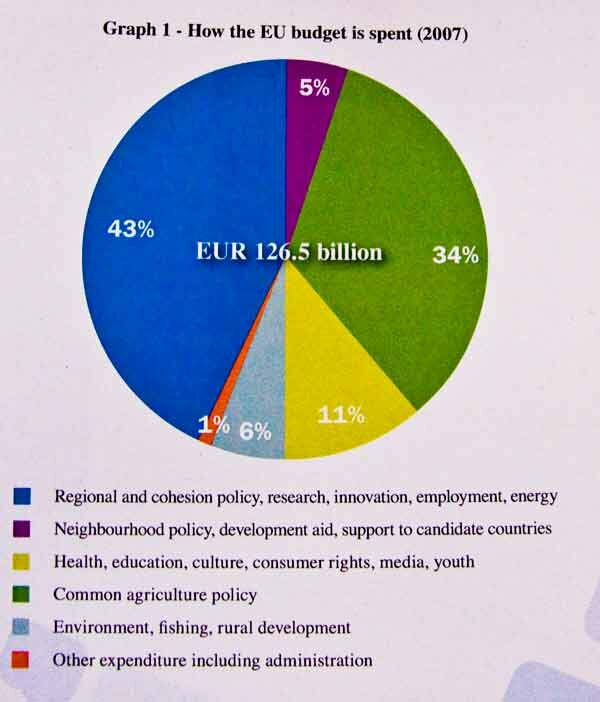 Take, for example, the pie chart below, reproduced in the briefing materials and purporting to show how the EU budget is spent. Please note that for no apparent reason the Common Agricultural Policy - the single largest and arguably most controversial area of EU expenditure (though not a topic for discussion at the Tomorrow's Europe event) - appears to be the second largest area on the chart. Yet the largest is actually made up of five separate and barely-related other areas - regional and cohesion policy, research, innovation, employment and energy - separate figures for which are not given. Is this kind of information really a sufficient basis for a true deliberative process? Especially considering that the input from the various participants in the small group deliberations - and even from the experts on the panels - were largely of the most general kind, and in any case were verbal, with no possibility of backing up statements with evidence. Can deliberation when not in possession of all the facts really count as deliberation? When a jury deliberates over a verdict in the legal sense in a court case, if evidence is withheld it can result in a mistrial. Is that the case here? Are we simply expecting too much? Or is this kind of exercise simply not capable of delivering enough? One further illustration of the point. In the final plenary session before the experts in the main chamber of the European Parliament, after the particpants had spent a whole weekend discussing the EU, one of the questions - agreed by an entire group as the one they'd most like answered, lest we forget - was "What is the role of the European Parliament within the EU institutions?" If they didn't know that most basic of things after three days of debate, how informed did they really become during the course of the event?